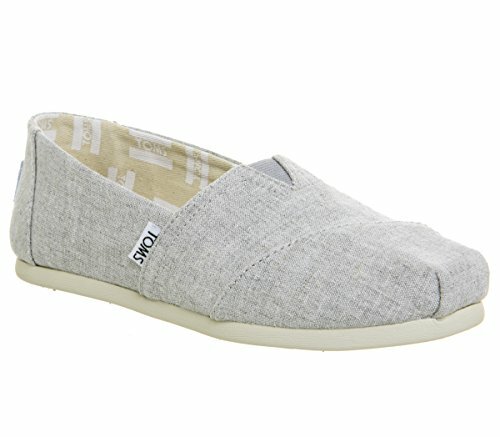 TOMS Women's Classic Slip-On (8 B(M) US, Drizzle Grey Slub Chambray) | What Should I Say? With every pair of shoes you purchase, TOMS® will give a new pair of shoes to a child in need. One for One®. Keeping it simple is the best way to travel. These Classics are designed for laid-back comfort on the move. Canvas upper with classic toe stitch detailing. Elastic V-panel for easy on and off. Breathable textile lining. Suede leather footbed provides light cushioning. Latex arch insert for added support. Flexible, one-piece, mixed-rubber outsole. Imported. Measurements: Weight: 4 oz Product measurements were taken using size 8.5, width B - Medium. Please note that measurements may vary by size. Breathable textile lining. Suede leather footbed provides light cushioning. Latex arch insert for added support. Flexible, one-piece, mixed-rubber outsole. Imported. Measurements: Weight: 4 oz Product measurements were taken using size 8.5, width B - Medium. Please note that measurements may vary by size.